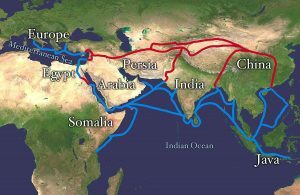 The Director-General of the Nigerian Maritime Administration and Safety Agency (NIMASA), Dr. Dakuku Peterside, has said that the Chinese Belt and Road Initiative (BRI), also known as the Silk Road Economic Belt and the 21st-century Maritime Silk Road, will be a game changer for global transport and substantially affect the pattern of global commerce. Dakuku stated this in Dubai during the Dubai Maritime Summit 2018, which was part of the events at the five-day UAE Maritime Week 2018 that ended on November 1. Speaking on the benefits and risks of the BRI, a Chinese government development strategy aimed at enhancing regional connectivity through infrastructure development and investments in Europe, Asia and Africa, the DG urged African and Middle East countries to plan mitigation measures against potential risk elements of the initiative. He identified the likely risk elements to include trade imbalance in favour of China and Chinese control of trade infrastructure, which will give it a lot of leverage in the global market place. However, he said the benefits of the Chinese economic initiative outweighed the risks. The Dubai Maritime Summit brings together the maritime sector’s leaders, decision makers, policymakers, high-level government officials, and regional and international maritime industry leaders to deliberate on issues affecting the global maritime industry. Previous editions included some of the most distinguished local and international guests, such as Secretary-General of the International Maritime Organisation (IMO), Kitack Lim, and UAE Minister of Infrastructure Development and Chairman of the Federal Transport Authority, Land and Maritime, H.E. Dr. Abdullah Belhaif Al Nuaimi.